Spin Analytical manufactures two styles of centerpieces that have different sector angles, the Spin50 and Spin60. Both are compatible with all Spin Analytical cell components, rotors, and the CFA. Both are compatible with all Beckman cell components, rotors, and the XLA or XLI. 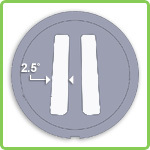 Both are available in 3 mm or 12 mm (standard) optical pathlengths (see below). Both have the same chemical compatibility as Beckman epon centerpieces. Both may be ordered with either graphite or aluminum filling (see below). Both centerpieces may be operated at temperatures between 0 and 40 oC. Both centerpieces are compatible with all CFA optical systems. Both may be operated without damage at 60,000 rpm, as long as there is no sample leakage (see below). Both centerpieces are compatible with the XLI interference and fluorescence optical systems. The Spin50 is compatible with the XLA absorbance system. The Spin60 may or may not be (see Optical System Compatibility). Spin50 and Spin60 centerpieces are manufactured with tighter tolerances than Beckman centerpieces to ensure better signal uniformity with fluorescence detectors. The filling procedure is the same (see below). Spin50 sector angle is wider (2.5 degrees) and the Spin60 is narrower (2.0 degrees). Spin50 filling volume is 430 uL and the Spin60 is 325 uL. If one sector leaks (maximum force on the septum), the Spin50 may suffer catastrophic damage (e.g. septum breakage) at speeds greater than 50,000 rpm. The Spin60 usually remains intact up to 60,000 rpm. Because leaks may result from improper cell assembly technique, septum breakage is not covered under warranty. The Spin50 has the identical geometry to the Beckman centerpiece. Therefore it is guaranteed to work with all of the XLI optical systems. In some XLAs, the narrower sectors of Spin60 centerpiece may cause increased noise in the absorbance signal due to inconsistent timing of the flash lamp. Users who are interested using the Spin60 centerpieces with the XLA absorbance system should request to try one first to see if their instrument is compatible with it. NOTE: If the flash lamp or its power supply are replaced during XLA servicing, it is possible that the instrument will no longer be compatible with the Spin60 centerpiece. Both the Spin50 and Spin60 centerpieces are made from filled-epoxy. The filler (either aluminum or graphite powder) helps with thermal conduction, and does not add to the centerpiece strength. The thermal conductance is the same for aluminum and graphite. During manufacturing, all exterior aluminum powder is removed, so that only epoxy contacts the sample. The graphite filling may have both epoxy and graphite in contact with the sample. Experience shows that there are few, if any, biological samples that react with either filling-type. Spin Analytical makes centerpieces with either round or elongated sample filling holes. The elongated holes make filling easier by allowing the air to exit. Centerpieces with either round or elongated holes are compatible with the Spin Analytical Cell Washer. NOTE: The Beckman “flow through” centerpieces are not compatible with the Spin Analytical Cell Washer. Fill holes are 0.040” in diameter. Capillary ended gel loading tip has 0.025” in diameter and has a maximum volume of 200 uL. 23 Ga stainless steel blunt end syringe tip (Small Parts P/N NE-231PL-25). Gel loading tip with capillary end (VWR 37001-150). You can also use two tips piggy backed to get the small fill tip, but larger volume. Use the above gel loading capillary ended tip piggy backed onto P/N 1022-8950 from USA Scientific. *When loading the centerpieces, make sure to stick the tip all the way into the fill hole and expel sample as you draw the tip up. Spin50 and Spin60 centerpieces may be ordered with 12 mm (standard) or 3 mm optical pathlengths. The 12 mm centerpieces are identical to the Beckman 12 mm centerpieces.